Rings of fungus which grow in grass or turf. This is where faeries and witches gather to dance and sing so it can be a very dangerous place to step in unaware. If you are drawn inside you can only escape the dancing faeries if a human chain pulls you out of the ring. You will lose all sense of time and what might have seemed like minutes could have been hours. But this is the down side of faerie rings, there are some advantages. 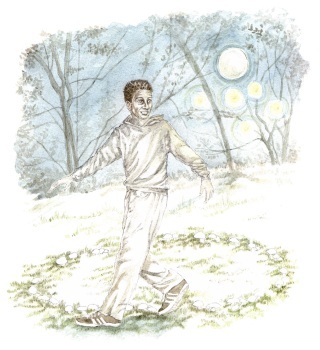 If you run around a faerie ring nine times under a full moon this will enable you to see and hear the faeries, but do not do it on All Hallows Eve or May Eve as these are very important faerie festivals. They would be very offended and carry you off to faerie land. If you would like a wish granted you have to stand in the middle of the ring under a full moon and it will come true. How you are supposed to do this without getting caught up in the dancing I don’t know, but give it a go, just remember to take back-up just in case!